Happy Bloggers Challenge Friday! This week I gave the Challenge Members the following Color Challenge - Crushed Curry, Soft Suede and Old Olive, Neutrals as needed. 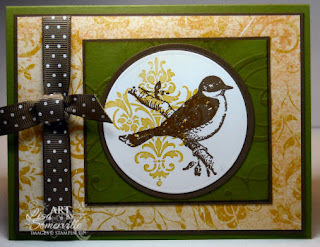 To create my card, I used Mojo Monday Sketch 98 as my inspiration, and Stampin' Up! 's Friends 24-7 Stamp Set. The damask image is stamped in Crushed Curry (that as been stamped off) on White, with the bird image being stamped in Soft Suede. The circles are cut with the Big Shot and Spellbinders Circle Dies. To add texture to the Old Olive Piece, I used Stampin' Up! 's Texturz Plates, then highlighted the embossed area. Thanks for stopping by, looking for more inspiration using these colors, click on the Bloggers Challenge Logo on my sidebar. Very classy, Lisa! Great job! Very pretty! These colors are perfect with this set. This is just so beautiful, Lisa! Love the demask image behind the pretty bird! Very pretty Lisa. I love that stamp set. The Damask behind the bird looks wonderful. Very pretty card Lisa, like the detail in it. Great card Lisa! Of course now I wish I would have tried my hand at the colors. I love the elegance of this card. The color combination is strong, but you made it so pretty. Beautiful! I love the colors with this set! I love the way that you used this layout with these colors! I especially love how you used the damask image behind the bird.